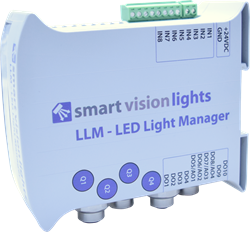 Smart Vision Lights announces it programmable LED Light Manager (LLM) which can address the lighting control needs of multi-light machine vision solutions, including photometric 3D and multispectral systems. To address the lighting control needs of multi-light machine vision solutions, including photometric 3D and multispectral systems, Smart Vision Lights is pleased to announce its programmable LED Light Manager (LLM) and associated light kits. The LLM can drive up to four separate lights of virtually any type or up to four individual quadrants or channels within an integrated photometric or multispectral ring light solution. Each program can contain up to four sequences with up to four lights set to continuous on, off, any intensity level in between, and even OverDriveTM strobe mode. To program the four quadrants of a single LED illumination system such as a ring light or four separate LED light sources, simply connect the LLM to a computer via Ethernet cable and use the browser-based interface to program the light through a series of drop-down menus. The intuitive user interface makes it possible for technicians of any level to set image sequences and program intensities for each light. LLM is also appropriate for multispectral imaging solutions where the LED wavelengths — and not broad-spectrum white lights with optical filters in front of the sensor — are the spectral band selection mechanisms. Using the color of illuminating light as the spectral band selection mechanism can greatly reduce the cost of multispectral imaging solutions, while increasing budgets for imaging applications. To simplify the design of photometric 3D systems, SVL has created a number of LLM Photometric Light Kits that include lights with our universal internal drivers, oblique-angle brackets for directing light, and the requisite cables. By offering both NPN and PNP inputs, most of today’s smart cameras can directly drive the lights at 2 A in continuous mode or 10 A in OverDriveTM mode. Technicians can add a second power supply to increase channel output beyond 2 A.